Do you want to attract more clients from Great Britain to your language school, marina, hotel or villa? Then contact North Devon Web. If you have an English website that is selling products or services based in another country it is important to ensure the language used is easily understood by the viewer. Ambiguity will put clients off. Puerto Calero, Lanzarote - Public Art? 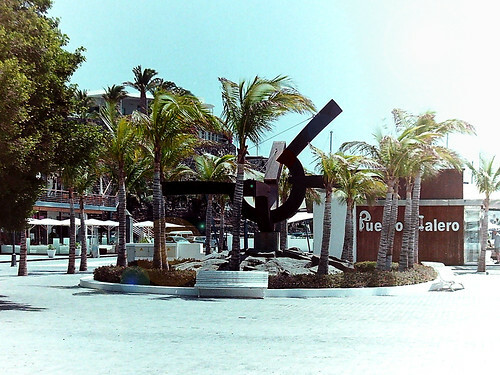 I have no idea what the sculpture (public art) placed in the entrance to Puerto Calero marina is all about but I love the way it simply sits there and is being obscured by the trees. The term public art is especially significant within the art world, amongst curators, commissioning bodies and practitioners of public art, to whom it signifies a particular working practice, often with implications of site specificity. The need to display art in a public place is usually driven by the ego of a local authority or prominent business or public figure within in a community. Placing grandiose statements within a town or city is seen as a way of increasing the importance of a place. There is a misconception that art elevates and rejuvenates an area – this is incorrect. There is more bad public art than there is good – out of proportion statues of footballers for an example. The image above was taken using a Pentax P30 SLR film camera. The film used was Fujicolor C200, a budget-priced film (expire date April 2014). The beauty of using 35mm film cameras and film is not knowing what you have taken a picture of straight away – the final image is a process of design, skill and chance. The chance element is the big buzz … Continue reading ?